Well, I saw the suggestion of “reluctant male readers” and since I’ve been really into male POVs lately, I can’t help but pick that one! I’m taking on some of my favorite books narrated by a male main character AND by a female MC that I think would work well for male readers! Where She Went (If I Stay #2) – Gayle Forman || Where She Went Re-Read: Adam Wilde is hands down my favorite male narrator. Gayle Forman is pretty genius and his voice feels incredibly genuine in this book! The Beginning of Everything – Robyn Schneider: I fell in love with The Beginning of Everything and I was surprised that it was a male POV! I actually wasn’t expecting it. Ready Player One – Ernest Cline: READY PLAYER ONE totally surprised me. I was like ehhhh, video games, ehhhh boy things but HELLLOOOOO it was so awesome and so much fun. Clearly, I love snark and sass and fun male attitudes so the guys in RPO were totally for me! Especially if you’re a guy (or you know a guy) who does like audiobooks…. Get the audio! Insignia – S.J. Kincaid: INSIGNIA was actually one of the first books YA books that I read with a male POV. I think I had read a couple before but usually shied away from them. I totally loved it — not expecting to at all — and the main characters is fourteen, so it’s easy for younger teens to enjoy as well! How To Lead a Life of Crime – Kirsten Miller: HOW TO LEAD A LIFE OF CRIME is another book I didn’t expect to end up loving but totally did. I thought it was going to be something about super heroes, but it was actually more realistic fiction with some action and a whole lot of mind games. I almost wanted to label it as dystopian but it really wasn’t. It was definitely enjoyable and something I’d recommend to guys and gals alike who are looking for a little bit of a darker read. Champion (Legend #1) — Marie Lu: I just finished LEGEND this past week — finally! — and I think it’s totally on par with The Hunger Games… With the potential to be even better, I think! I was so impressed with Marie Lu’s characters — a strong female in June and equally strong but not as obviously so in Day. Marie Lu is an amazing writer. There were so many things I didn’t see coming and an interesting post-apocalyptic/dystopian world. The Hunger Games (The Hunger Games #1) — Suzanne Collins: Obviously. These books (and now movies) are BIG — and totally worth it! I think male readers would appreciate the action, adventure, and even a bit of gore. I also like how it focuses on the political aspects and doesn’t get too heavy into the romance, despite the fact that it is a big part of the series. Cinder (The Lunar Chronicles #1) – Marissa Meyer: Okay, so many Cinderella retold doesn’t really appeal to guys but it’s my FAVORITE series. It’s exciting, surprising, unique, and creative. I was never bored and every situation is innovative. So just try it, huh? Shadow and Bone (Grisha Trilogy #1) – Leigh Bardugo: Another favorite! This may appeal more to guys than Cinder does though. It has a bit more of a militant aspect (over political figures) and instead of Lunars, we have some kickass magical elements through the Grisha. Dangerous villains, creepy creatures, darkness, armies, magic, fighting. Trust me… It’s awesome. The Raven Boys (The Raven Cycle #1) – Maggie Steifvater: The Raven Boys is a bit of a different choice. I feel like the tone is very deliberate and sophisticated (not that the other suggestions aren’t, but you know what I mean). To say it’s lyrical would probably turn some guys away so forget I said that! No, don’t run! The Raven Boys has intrigue, mystery, history, paranormal, and some amazingly real characters. Most of the characters are actual male — the boys of Aglionby (“the raven boys”) — and Blue is pretty much the only girl, and a independent, feisty one at that. I think it’s a really interesting read and that anyone can enjoy it! I have plenty more books that I love with a male main character (as noted in one of My Latest Bookish Addictions) but I wanted to include some of my favorites with female voices as well! What books have you recommended to your male friends and family? Students? Significant Others? 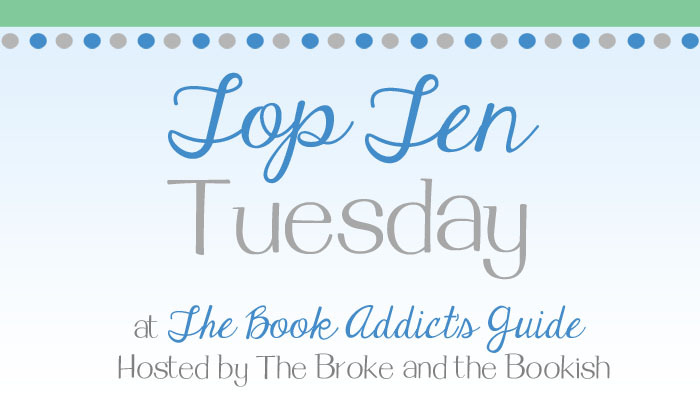 This entry was posted in Books, Top Ten Tuesday and tagged Books, Male POV, top ten tuesday, YA, Young Adult on November 19, 2013 by Brittany. I recommend books to my stepson all the time and he loved Ready player One and The HUnger Games series! Awesome list and we’ll both be reading some of our selections. I did my topic on books I rec to my husband. I have Legend on my list, but some of these other ones would probably be good for him too. I want to read the Grisha trilogy and the Raven Boys so badly!! I just won the first book of the Grisha trilogy, I can’t wait to get started!! I loved the Legend series so glad that you did too! And my husband read The Hunger Games trilogy and really enjoyed it. I do think that series has a wide appeal. I would recommend Partials by Dan Wells, I think guys would like that book. And The Beginning of Everything does sound interesting…I may have to add that one to my TBR list. Great list! I love the POV character for Where She Went. I didn’t think Forman could pull off the male POV after being blown away with her female POV in If I Stay. I was so wrong; it was amazing. I just finished The Raven Boys and recommended it to my husband. He really liked it too and he’s not much of a reader.